Posted on Friday, January 9th, 2015 by CommunityEngagement. 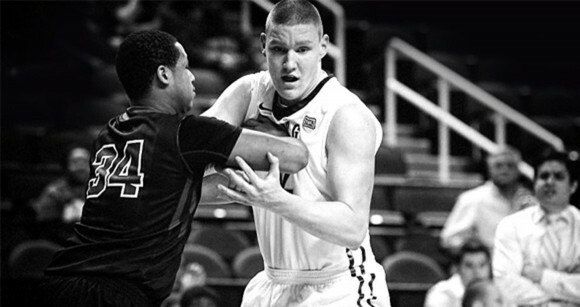 At 6 feet, 9 inches, UNCG post player Jordy Kuiper is a big presence in the lane. What’s more impressive is his role as supporter for those living – and living their dreams – with diabetes. He is ambassador for the Bas van de Goor Foundation, whose mission is to enhance the quality of life for people with diabetes through exercise and sport. The Netherlands native was diagnosed with Type 1 diabetes when he was nine years old. His question to the doctors: Would he be able to play basketball? The answer has been a resounding Yes. It has taken dedication and discipline, planning and care, throughout the years. He’s a role model for lots of young people. He spoke to a gathering of the Triad’s Juvenile Diabetes Research Foundation Family Conference, with kids nine to 16 years old in attendance. He’s kept in touch with many of the kids he met. He supports them, they support him, as they share about their own experiences with diabetes. Everybody is different, he says. Everybody has their own path to success with diabetes. “I’m on social media daily – kids from Holland and Germany and America.” He is encouraging. For him, that’s meant American Division I basketball. It takes endurance and tenacity – particularly in the paint. “It’s physical – using your hips to get position to box out. It’s a constant battle.” Defense has always been Kuiper’s forte, and his offense has come forward this year. He is shooting nearly 50 percent from the floor for the Spartans, one of the best percentages on the team. His goal is to someday play Euroleague ball. He recounts a favorite moment from this season. It was at Big Ten power University of Indiana’s Assembly Hall. “The second half, we fought back into the game. We really felt like we were playing as a unit. We were getting stops.” They pulled to within six points, for an exciting finish. The big SoCon win at East Tennessee State was great too. And then there was the game against Greensboro College, where he had his first double-double as a Spartan: 11 points and 10 rebounds. He’s living his dream, thanks to lots of hard work and discipline. He’s typically the first player Coach Wes Miller calls off the bench, ready to give the team a defensive boost. View film clip of Jordy Kuiper produced by SoCon. See schedule of remaining games.